I like gum. But every time I discover a favorite, it is magically discontinued. For example, I was totally addicted to Peppermint Sugarless Bubble Yum. A few years after I graduated from college (in 1999) I quit smoking. I referred to Peppermint Sugarless Bubble Yum as my “quit smoking gum.” Thankfully they didn’t stop making it during that difficult phase. Proudly, I have been cigarette free since January 3, 1999. 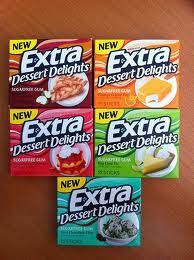 But, I do miss the gum. 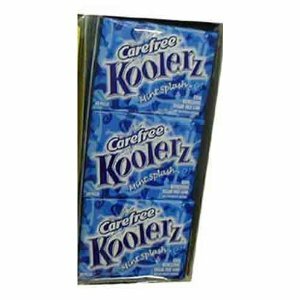 Then, around 1999 when I moved far from home and turned into a gym rat, I found a new love: Carefree Koolerz Mint Splash. It was *almost* as good as the Bubble Yum. I chewed the Koolerz religiously for years. Then alas, about 6-7 years ago I guess it has been…that too disappeared. Such a bummer! I liked the soft, plumpness of both of these minty treats. The flavor lasted a long time without getting rubbery. I think I have since tried about every sugar-free gum on the market. But alas, none compare. I have settled on the Extra desert gums. They are ok to treat a sweet tooth, but I find myself spitting them after 15 minutes; whereas, with the Bubble Yum & the Koolerz I’d chew them for hours on end. 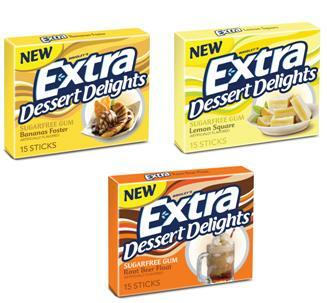 Some of the new Extra flavors are a bit funky. The Key Lime is pretty good. I don’t really care for the mint chocolate. The Apple Pie is too ‘spicy* for my liking…it’s very sweet. And, most recently I tried the root beer, and I am not feeling that one at all. If anyone has any suggestions for smooshy minty gum like the old Bubble Yum or Koolerz, please tell me.